You are here: Home i In Focus i In focus 2019 i Future of Work Iceland i Equal pay: a fight between genders or between the rich and poor? “We must not be passive observers. We must not only focus on powerful women with high incomes. We must start to focus on low income women and increase their wages,” said the newly elected trade union leader Sólveig Anna Jónsdóttir. She has been working as a low-paid nursery teacher in Reykjavik for several years, and knows many women who cannot make enough money to support themselves and their families without taking on second jobs. She said the job is poorly paid, and that there is no economic justice to how childcare is rewarded. In her opinion it is all about money – the rich and powerful do not want to do anything about the injustice. This is class war with the aim of securing low salary women a wage which will support their family. Researcher Kjersti Misje Østbakken at the Oslo Institute for Social Research showed how the global pay gap is 23 %. The gap varies between different countries, and also within countries, both per year, month and hour. According to her numbers, the wage gap in Norway stood at 12 % per hour in 2014 – men were paid 100 kroner while women were paid 88 kroner. Østbakken explained that nearly half of the wage gap can be explained by the type of jobs people do. The gap is widest between men and women in high salary jobs – 20%. It is narrowest among low paid public sector workers and widest among high earners in the private sector. Women in the public sector are the most poorly paid, while men in top private sector positions earn the most, regardless of which sector they are in. Male leaders are the best paid. Østbakken thinks the pay gap cannot be eliminated without addressing the gap within top private sector jobs, where it is widest. British journalist Femi Oke opened the panel debate. She asked whether low paid women should have their wages increased in order to attract more men to their kind of jobs. The head of The Federation of State and Municipal Employees Sonja Ýr Þorbergsdóttir explained how middle-aged men started to work in nurseries during the financial crisis in Iceland. Most reasoned that they had never had the chance to do this because it was so poorly paid. When they lost their day job they would chose to work in a nursery over being unemployed. Sonja Ýr supported the idea of paying better for traditional female occupations. That would make these jobs more attractive for men. Sonja Ýr Þorbergsdóttir and Þorsteinn Víglundsson. The MP Þorsteinn Víglundsson believed the wage gap should be solved through collective agreements and legislation. The future is knowledge-based, and for that you need education. Teachers are among the most poorly paid in Iceland. The care sector is becoming increasingly important as Iceland’s population is ageing. He believed supply and demand could not explain the gender pay gap. “Gender pay gaps must be prioritised, not just discussed. We have to act,” he said. Nearly three quarters of all women in the Nordic countries are in paid employment. Women’s work contributes to a better economy. But the Nordics have yet to achieve full gender equality in the labour market. More women than men work part-time, and women do more unpaid domestic work. More women than men leave the labour market and rely on care, rehabilitation or disability benefits. This is especially true for women who work in the care and education sectors in Iceland. Their jobs are both emotionally difficult and challenging. This has a negative impact on women’s pay, their career development and future pensions, according to Iceland’s Prime Minister Katrín Jakobsdóttir. Care sector jobs are not going to be taken over by robots, so there is a need for both men and women to work there. Women do not strive to work as long hours as men. But the imbalance in working hours between the sexes also has a negative impact on women’s working conditions. When men work overtime, women’s working hours are shortened and their unpaid efforts increase. There is a need to address the gender segregation in the labour market and the undervaluing of women’s work. Katrín Jakobsdóttir has said that Iceland will eradicate gender pay gaps by 2022 through the equal pay standard. Employers will be responsible for making sure there is equal pay for equal work. 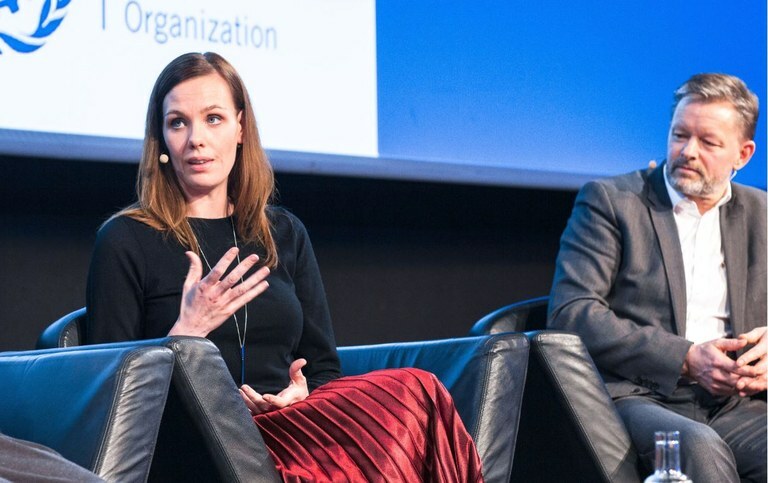 The debate got hot as gender pay gaps came up during the Future of Work conference in Reykjavik. 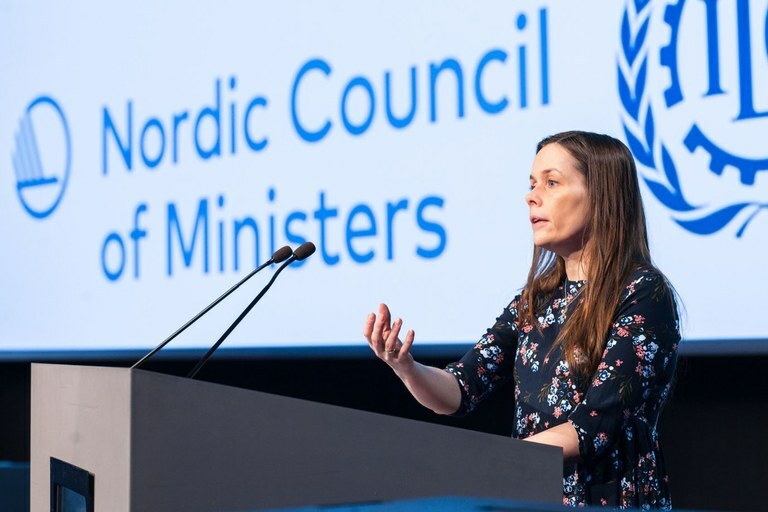 "There is no economic justice to how childcare is rewarded," said the newly elected leader for the Efling trade union, Sólveig Anna Jónsdóttir (above).